Here is some help for people who have taken my course and are trying to back test strategy 1 and strategy 2 of my course. He is a full time trader since the last 4 years. He has already done the job of back-testing my strategies for you. As promised, here is the testimonial. I am a full time trader since last 4 years. I took your course 7 months back and was really impressed. I had read lot of books before that but your strategy 2 rang the bell in my head. I backtested 2 years of 15 minutes data of Nifty (Amibroker) and kept on playing with some parameters. I noticed that when VIX > 17 and Nifty premium received ( from Strategy 1) > 0.004 of Nifty current value, results were superb. In last 7 months, I took 8 trades and all were profitable. The best thing about this strategy is it is scale-able. Right now I am doing it on 14 lots. See that he trades on 14 lots which is 14*75 = 1050. So basically margin blocked is 40,000 * 14 = 560,000 (Five Lakhs Sixty Thousand.) I think slightly less than that. Whatever, 3% of 560,000 is Rs. 16,800 per month. 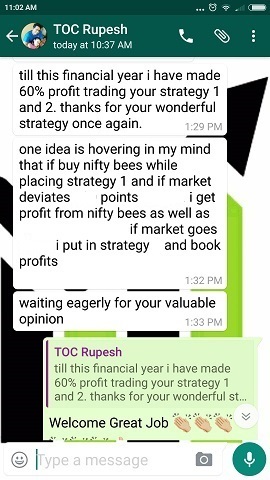 Remember that good traders do make more and specially Strategy 2 makes around 5% a month. But lets calculate on the average case scenario on Strategy 1. He has NEVER lost money. So his profits in last 7 months is 16800 * 8 = Rs. 134,400.00. Remember when you call me to inquire about the course I say success rate is 80-90%? But here we have a trader whose success rate is 100%. If you can time the VIX your success rate also can be near 100%. 134,400 is 24% of 560,000. This means in 14 months around 48% returns. Lets take out 8% just in case he makes small losses in couple of trades. How is 40% return in 1 year and 2 months? And this in the conservative strategies alone. 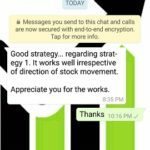 I am not even taking into account what the other strategies can do – the conservative stock option and the directional trades. One more thing – these are ALL REAL traders doing REAL trades – just like you. In my view this is MUCH BETTER than what Ravi accomplished. Why? Because he is sticking to very conservative approach and making sure that his growth is slow and steady and forever. No fear, no Intraday – just pure conservative approach to trading. We have not even looking at the compounding effect this can have. Today he is trading with 14 lots, tomorrow 24 and then 50, 100? Sky is the limit when you trade conservatively. When you know the max loss is 10 or 20 points why stop at 14-20 lots. SCALE. That’s my idea of my conservative and compounded trading strategies. If not here is the details of my conservative option trading course. 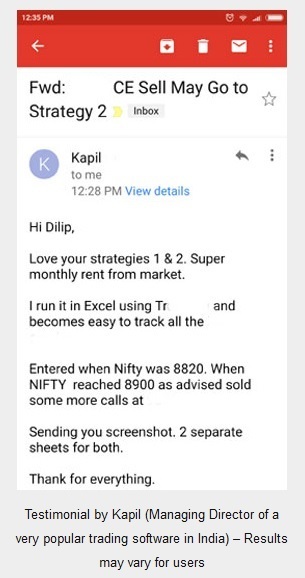 Sir though its not a appropriate forum to discuss other than nifty options, but i want to know what is “pair trading” in stock futures. Is it a hedged strategy wherein both sell and buy can be done, whether it is possible in options. 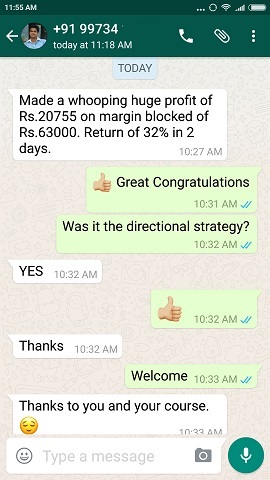 Shubha, “Pair Trading” is done by experts in the field where if they are long in some stock they go short in a similar stock and try to make money from the difference in the profit and loss. For example some people go long on Nifty and Short on Bank Nifty. In my books this is not a good trade. Its much better to hedge your trade in the same instrument, rather than different instruments. Pair trading is a huge subject and cannot be explained in details here. But I hope the idea must be clear. Above sentence is divine music 2 the ears of All Traders. Testimonials prove Ur strategies r next to HOLY GRAIL if not HOLY GRAILs themselves. I can only say I am lucky to have such great traders as my customers. These people will always perform better. 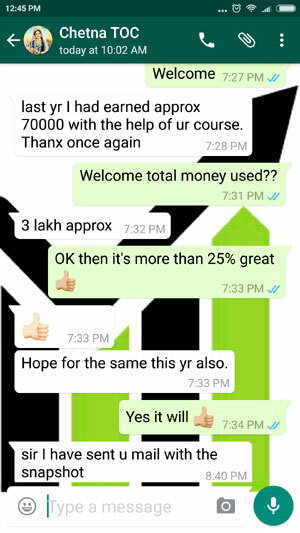 They buy my course, get knowledge + use their own knowledge to better the strategies. Results are for everyone to see. Not losing money in straight 8 trades means a lot of credit goes to this trader too.